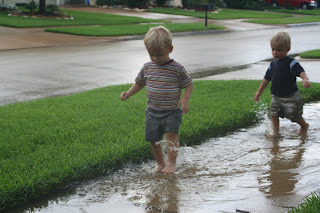 Saturday brought buckets of rain in the afternoon giving us some much needed relief from the hot and humid temperature that's been reaching over 90 degrees most afternoons. 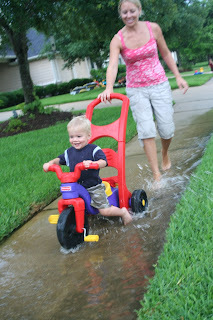 The kids loved jumping in the puddles and riding through them with their "cars" was definitely a splashing hit. 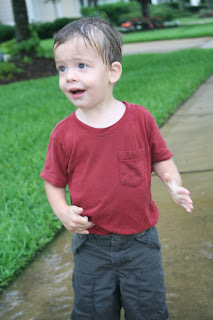 Why Can't I Take My Clothes Off In the Front Yard? What fun to open our eyes to all the ways God provides and blesses us. 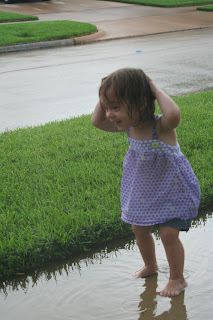 Simple excitement, laughter, splashes-thankful for the goodness of God in rain and puddles. Noah, Cohen, Finn and Sophia-you are growing up all too quickly! Miss you, much love.